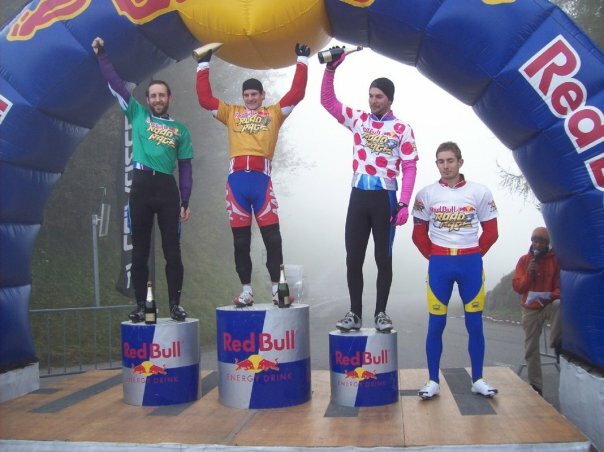 Red Bull Road Rage – 2nd in Rengg, Switzerland. I’ve decided to make an effort this time and write the blog myself. I’m just back from Switzerland where I took on a bunch of Euro speed junkies and won (well almost). After posting the top time in qualifying covering the 2.1km course in just 99 seconds (top speed 90km/h and an average speed of 76km/h) my confidence was given the boost it needed after being snapped by the sheer scariness of the descent. The course featured 6 hairpin turns in the top half with sections of road at nearly 20% gradient, with the average at 10%. On top of that the surface was wet from the rain the night before. Turns out it seems to work in my favour. Must be the Irish in me!! I was never pushed through the rounds but I knew that when the racing got tough I would need to find that little bit extra to come out on top. The 1/4 finals saw some big names fall: Frédéric Moncassin, two time stage winner and yellow jersey wearer in the Tour de France and winner from the French event, failed to progress to the semi finals, as did defending Swiss Road Rage veteran Guillaume Gaulandi from France. Having had to pull out all the stops in the sprint finish to take the round against two time German national 4Cross champion Thomas Schäfer, winner of the German round, in the 1/4 final, I was under no illusions of the strength in depth of the field in Rengg. For this reason I went all out in the semi final from the gun, blowing out Mauro Bettin, winner of the Italian event (the Italian pro ex-roadie turned enduro mountain biker – 2005 mtb xc marathon world cup winner) and eventually coasting across the line well clear of the field. The final was a different proposition and I found myself in third in the first corner. The racing was messy, dangerous and probably not within the rules but in the end I was pipped by Sebastian Körber from Germany into second. Disappointing in light of my overall performance and considering I was the quickest down the hill TT style, but I can’t really complain. I know my first win is just around the corner. Now I’m looking forward to some intense (and injury free) winter training and maybe some sponsorship if anyone’s as brave as Mick Jordan from the Cycle Inn Bike Shop. Can’t wait until next year and a new season of Red Bull Road Rage. You are currently browsing the Janos Köhler's Blog blog archives for October, 2009.